The question levelled at God, by each of us at some point, is also the first question addressed in the Bible. An entire book, recounting a carefully-crafted story, explores this ever-present question of suffering. Reading the Bible from cover to cover you might think the book of Genesis was written first and Revelation last. But, they weren’t. The 66 books of the Bible are arranged in a fashion that roughly fits the timeline of their collective story. But, if you place the books in the order they were written, you find Job in the lead. Why? God meets people where they are. Suffering is a constant and devastating reality in this fallen world—a reality that seems senseless and unfair. So, God starts His Word with an epic story of suffering. 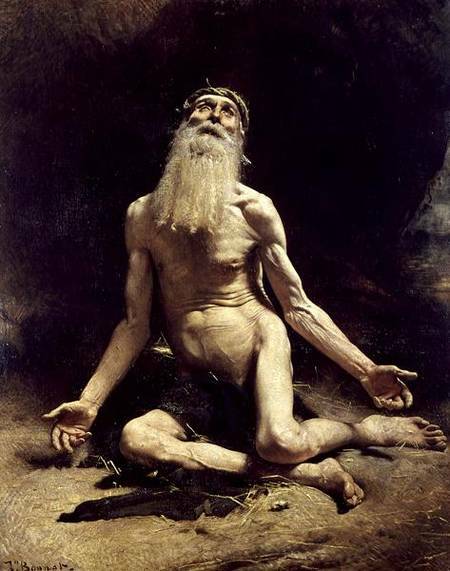 In Job, suffering’s story is told, human explanations of suffering are given and God is allowed to respond. As a microcosmic treatment of the universal question of suffering, Job may seem far too short—the suffering of planet Earth in a 42 chapter nutshell. But, the answer it gives to the question of suffering is both powerful and hope-filled. In short, the story of Job is this: A man who has everything looses it all. His livestock die, property burns, children are crushed and his body is covered with boils. Those who remain, assigning blame for the suffering, provide no comfort or answers. Job is a Godly man and innocent of all charges against him. Through the entire drama, Job shouts questions and accusations into the darkened sky—targeting the God whom he loves. And, in the end, God responds. On the bookends of this tale of one man’s suffering, a greater debate—a much larger story—is revealed. God and Satan are discussing planet Earth. God sees His image revealed in it: There is still beauty, purity, justice—a love for Him and His ways—among Earth’s people. Satan sees only himself in the people of earth, except for those people God treats unfairly by blessing them and protecting them when they don’t deserve it. Job is chosen to embody the debate. This one man will provide an earthly answer to the celestial question of God’s image in humanity; present or absent. The next three are his friends. We know they are his friends because, firstly, they are described as such but, secondly, because the spend seven days listening to his laments, attending to his needs, and quietly being with him. An enemy would not have the respectful patience required to donate a week of silent compassion. When they finally speak, each friend bring accusations against Job. As you can imagine, Job is also unhappy with this counsel. At this point in the story—and seemingly the point altogether—no human wisdom is able to answer the question of suffering. Again, Job cries out to God. God is not amused. He tells Job, again, to stand up and face Him like a man. This time, the voice from the whirlwind takes Job to the zoo. God parades a menagerie in front of Job and asks for a detailed explanation of each—from the skeletal/muscular structure to living environment of each creature. God doesn’t stop for answers, He just keeps the questions flying, until Job recognises his place. The story wraps up quickly after Job’s confession. God restores Job’s fortune. He straightens Job’s friends out with a few succinct verbal slaps. And, seemingly, the wager in Heaven is over. God wins. His image remains on Earth—alive and well in those who face suffering without silence. God find’s Himself in Job and Job finds himself in God. And we find the answer to the question of suffering. It is revealed in actions, not words. When you are suffering, it is not your fault. Eliphaz has the wrong answer. When life falls apart, it is not your family’s fault. Bildad has the wrong answer. When sickness strikes, repressed sin is not at fault. Zophar has the wrong answer. When you fall, God didn’t cut the rope so you’d land on Him. Elihu has the wrong answer. Following Job’s wife’s advice to “curse God and die” only punishes two innocent parties. She, definitely, has the wrong answer. Each of these are attempts to answer the question of suffering from within the egocentric place of personal suffering. But, remember the bookends of the story. There is a war raging on our planet. Both sides are looking for themselves in you. Ultimately, the answer to the question of suffering is revealed in snapshots each time we participate in suffering. Job’s three friends demonstrated the answer before they spoke. They showed up. They were present during Job’s suffering. God showed up, too. God was there all along but Job teased Him out of His silence by demanding a verdict—guilty or innocent—from the heavenly courts. And God let Job have it! We will all receive such a hearing. And we will all be humbled and healed if we have failed to be silent both in our suffering and the suffering of others. Suffering is all around us. The story of Job offers conclusions that, if put into practice, will ensure the image of God is seen in His people today. Secondarily, when we suffer, we are allowed (encouraged even!) to shake our fist at the heavens and demand answers. Suffering isn’t fair. And, when faced by God’s children, it shouldn’t be taken silently. It’s not your fault. It’s not the fault of those around you. Don’t curse God and die. In the depth of despair, it’s ok to ask questions—at whatever volume. God loves you. He will never abandon you. Know this—even in the darkness—God loves you. Suffering is not meant to be. And it will end. Until then, remember there is an unseen battle raging around us—evil versus love—Satan versus God. Both sides seek their identity in you. One side brings suffering. The other brings compassion. Our actions declare our allegiance. ebook of The Perfect Lamb!